You can now focus in on 3 frequency ranges (LOW, MID and HIGH) both your reference track and your song. These buttons control filters added to your ref track and the master track. There is a volume slider underneath, controls the post volume of the reference track for easier balancing. Also an [M] button for mono-ing both your reference track and your song. 1. First load up the wav sample of your reference mix, into a renoise instrument slot. 2. 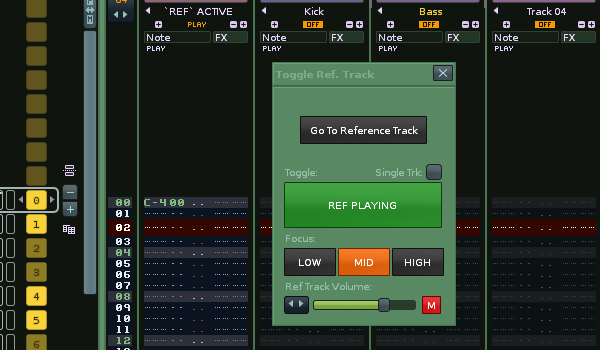 Right click on it in the instrument list and choose ~Create Reference Track from the menu. The wav you just clicked will also have autoseek switched on now. A C-4 is added to the first pattern to activate the wav. This will AB between the reference track and the rest of the tracks in renoise. This will AB between the reference track and the selected track in renoise. The tool works by adding a gainer that is controlled with track mute states so even when you are soloing other tracks and adjusting your own mix, the reference remains silent. The added track is automatically routed to the same destination as your master track so it bypasses master processing so you can get accurate AB testing. -cut the wav to a short section and loop it. -Use a plug like eXT to host the wav - not sure of any free alternatives that will autoseek the timeline like XT does but would be very interested to know. If you select a long sample and press this shortcut, the renoise song length will be adjusted by either adding empty patterns at the end of the song or deleting them to match the wav length. It will not delete any patterns with data in them though. Can be used for a reference track wav or any other long wav you want to adjust the song length to. I`ve separated it from the creation of a reference track as you may not always want that to adjust your song length to what your referencing. Plus it may be a useful standalone shortcut when working with long wavs anyway. shortcut which simply toggles the autoseek state of the selected sample. Saves going to instrument properties. Will simply navigate you to the reference track . For quick mono-ing of a whole mix by use of a custom Stereo Expander called "Mono Mix". It is added the Master track and the Reference track (if present). This shortcut can be used without a reference track to just to check your mono compatibility while mixing.